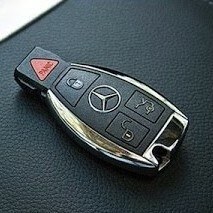 At Multi Locksmiths we can duplicate and make transponder and non-transponder keys and remotes for almost any Mercedes model. Our combination of affordable prices and superb quality locksmith services makes us the best choice in East Bay Area. If you lost your keys or are locked out and are desperate for a reliable and reasonably priced locksmith, we can offer immediate assistance to get into your vehicle. Mercedes no longer offers replacement sets for models released before 2000. Owners of older vehicles may turn to a dealer but many dealerships do not keep codes and have discontinued keys for older models. If you have lost all of your Mercedes keys or your last copy gets locked inside your car, a Mercedes automotive locksmith can make a new set of keys in no time. At Multi Locksmith we have the confidence that we can program and cut keys and will get the job done right the first time. We can make duplicates and program keys for most Mercedes models, including Mercedes-Benz GLK Class, Mercedes E Classe, Mercedes Benc GLS Class, Benz C Class, Mercedes S Class, Mercedes ML etc. r keys. With extensive experience with Mercedes locks and keys, we can duplicate and program computer chip, laser, and VATS keys for most models on the market. We are licensed, reputable, and mobile and offer upfront pricing. Whether you need to unlock your trunk or car door, activate a chip, or replace the ignition, you can contact us anytime to help you solve your key-related problems. We have the latest computer equipment and technology to make and program new key copies and will have your Mercedes keys cloned in a matter of minutes. Whether you have high security or double-sided keys that need to be duplicated, Multi Locksmiths is a mobile, reliable Mercedes automotive locksmith. It was only in 1998 when Mercedes released the first model that uses smart keys (S-Class). The smart key technology was introduced under the trade name Keyless Go. Models that come with keys without a remote control include Mercedes-Benz Vito, Viano, Vaneo, V-klasse, S-klasse, R-klasse, M-klasse, and others. Mercedes was one of the first automobile manufacturers to release models with smart keys and actually coined the term. Newer models are equipped with an infrared key that unlocks the door while in your purse or pocket. New vehicles feature a remote system that transmits infrared- and radio-frequency signals for improved safety and security.